Are you just starting piano lessons in the Bracknell and Wokingham area? 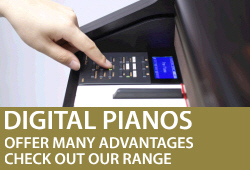 Sheargold pianos, based in Maidenhead offer a complete solution to any piano needs. Whether it's a second hand upright piano, a new digital piano, a piano tuning or just a piece of piano music we can help. Our helpful and knowledgeable staff can help beginner pianists by guiding you through the vast range of piano makes and models and help you make informed decision about which piano will suit you best. We offer free ground floor delivery to all addresses in Bracknell and Wokingham and also offer a piano tuning service. If your piano needs tuning call our piano tuning hotline on 01932 866577. 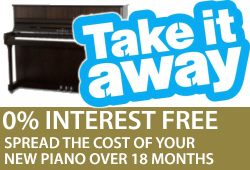 Our domestic hire allows beginners to hire a piano for 6 months to try before you buy. We offer this piano hire to customers in Bracknell and Wokingham as they are local and helps you make an informed decision. Do you have a piano at home that doesn't get used anymore? 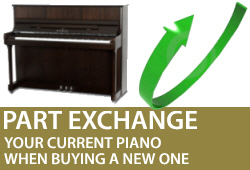 Why not call us on 01628 771400 with the piano's information and we may consider buying it from you. If you are looking to upgrade your existing piano then give us a ring to discuss part exchanging your piano for a new one.